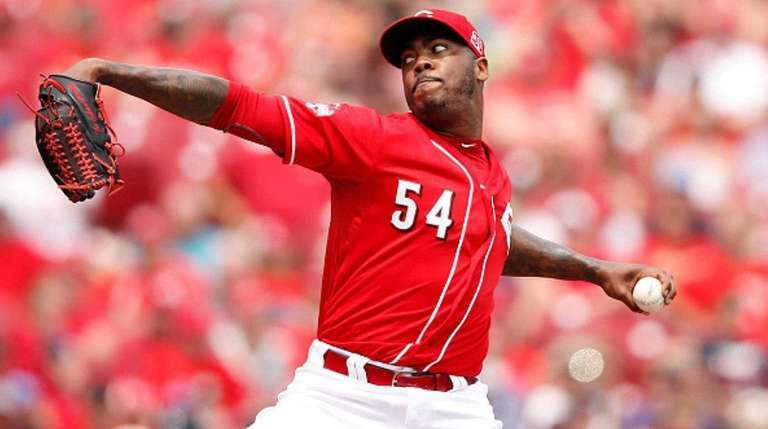 In acquiring four-time All-Star closer Aroldis Chapman from the Cincinnati Reds yesterday for four minor-leaguers, the Yankees added perhaps the game’s hardest-throwing lefthanded pitcher to an already formidable back end of the bullpen. But the Yankees also are taking on a player involved in a domestic violence investigation Major League Baseball. Chapman, 27, is alleged to have fired eight gunshots in the garage of his Miami-area home last Oct. 30 following an argument with his girlfriend, according to a police report obtained by Yahoo. Chapman still could face discipline from Major League Baseball, which announced a new domestic violence policy last August that affords the commissioner the freedom to either fine or suspend offending players. No player has been suspended yet under that policy. The domestic violence allegation was made public earlier this month just as the Los Angeles Dodgers were reportedly set to acquire Chapman. The Dodgers decided to back away from the trade; Cashman said that’s when he learned of the domestic violence allegation. Cashman said the Reds “modified” their asking price in a deal involving Chapman after talks with the Dodgers broke down. That apparently was enough to pique the Yankees’ interest despite the MLB investigation, which a spokesman said yesterday is ongoing. A longtime fan of Chapman’s pitching abilities – his strikeout ratio is consistently among the best – Cashman said the Yankees decided to pursue a Chapman trade after discussions with ownership about the risks involved. “We felt this was an opportunity to add a big arm to our bullpen even though there are some issues that are unresolved,” he said. From a baseball perspective, the move was a no-brainer. In exchange for minor-league pitchers Caleb Cotham and Rookie Davis and infielders Eric Jagielo and Tony Renda, the Yankees get one of the game’s best relievers and theoretically take the pressure off their efforts to upgrade their rotation by decreasing the number of innings they have to collectively log. Chapman had a 1.63 ERA with 116 strikeouts in 66 1/3 innings last season, adding another strikeout pitcher to a bullpen filled with them. Last year’s closer Andrew Miller posted a 2.04 ERA with 100 strikeouts in 61 2/3 innings while setup man Dellin Betances had a 1.50 ERA and 131 strikeouts in 84 innings. Keeping Miller and Betances also gives them insurance regarding what happens with MLB’s investigation of the domestic violence allegation of Chapman, something Cashman admits is an unknown. Chapman also is in line to become a free agent after next season, though a long suspension could potentially affect his service time and delay free agency by a year.